I’m often reminded, as if I needed to be, that I’m getting old. Ten years ago people said I was getting older, but now they say I’m getting old. And so I am. I admit it. It’s hard to imagine myself a senior citizen or worse “a golden ager”. I can remember listening the Beatles singing “When I’m sixty-four”. I can remember listening to Simon & Garfunkel singing “How terribly strange to be seventy”. Yikes! I’m almost there. Terribly strange old, that’s for sure. an endoctrinologist, or a whatever-ologist, to tell me what’s wrong with me. I’M OLD and I know it! Getting old is tough enough without everyone thinking that everyone old is stupid. There are less stupid people in their sixties, seventies and eighties (and nineties) than there are in twenties and thirties. Let’s face it, twenty-somethings and thirty-somethings are driven by hormones, us older folks not so much. But what I really hate is companies that prey on seniors thinking their foolish, old, tottering ignoramuses with money. I’m going to give you some examples of what I mean by companies preying on seniors – and I’m not even going to mention the IRS and computer scams that have ripped off older folks for zillions of dollars. “A unit of coverage corresponds to the life insurance benefit amount you can purchase, and it depends on age, gender and state. 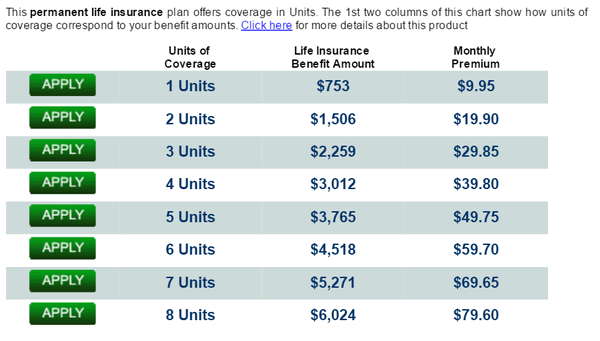 Please visit the Guaranteed Acceptance Life quote page to see benefit amounts and premiums available to you for up to 8 units of coverage.”So, I figured this on being 70 which I not – at least not yet. So if you’re a 70-year-old male, to get enough insurance to have a funeral, it would cost you about $80 a month. Yikes. Think of all the cheap bourbon you could buy for $80 a month. And you have to wait 2 full years before you drop off before you can get the “full” benefit. So you pay $80 a month for two years – then you can drop dead and you can take advantage of Colonial Penn for about $4000. However if you live 10 more years, Colonial Penn is taking you for $4000. It’s like them betting you’ll die in 2 years and you’re betting you won’t. Either way – you lose. Water, Corn Maltodextrin, Sugar, Milk Protein Concentrate, Canola Oil, Soy Protein Isolate, Cocoa Powder (Processed with Alkali), Corn Oil. Less than 0.5% of: Nonfat Milk, Magnesium Phosphate, Potassium Citrate, Cellulose Gel, Natural & Artificial Flavor, Calcium Carbonate, Salt, Calcium Phosphate, Sodium Citrate, Choline Chloride, Ascorbic Acid, Potassium Chloride, Cellulose Gum, Monoglycerides, Soy Lecithin, Carrageenan, Potassium Hydroxide, Turmeric, Liquid Sucralose, Ferrous Sulfate, Zinc Sulfate, Acesulfame Potassium, dl-Alpha-Tocopheryl Acetate, Niacinamide, Calcium Pantothenate, Copper Sulfate, Manganese Sulfate, Chromium Chloride, Red 3, Thiamine Chloride Hydrochloride, Pyridoxine Hydrochloride, Vitamin A Palmitate, Riboflavin, Folic Acid, Biotin, Sodium Selenate, Potassium Iodide, Sodium Molybdate, Phylloquinone, Vitamin B12, and Vitamin D3. I’d list the vitamins and minerals but it’s a long list. But basically Ensure provides about 25% of the RDA of most vitamins and minerals. An average daily multi-vitamin provides about 100% of most vitamins and minerals. Just because we’re old doesn’t mean we’re stupid…I ensure you, Alex Trebek. I agree 100%. Thanks for putting it in print. Unfortunately this is just a tip of the scam iceberg. Indeed, old(er) people are the bravest people in the world. I am 70, and apparently I no longer count – I’m disposable as far as society is concerned. Actually, that attitude was prevalent at age 65 (it just gets worse). Doctors have very little interest in old people – they mostly state, “Well, you know when you get old . . . ” So, all that said, all we older folks can do is the best we can, with God’s help. I enjoy your articles so very much! Thank you! One thing also gets up my nose! I often do survys on the web, fills in time, perhaps one learns a little and maybe earn a small amout of cash. But when I include my age (86), I often receive the “not wanted here” !! They are the ones missing out, my brain is as alert as when I was 40 or 50 and my experience should be of value. The body ages the mind does not. Just a small disadvantage of being (as TC/EB say) a golden oldie. I turned 73 in January. I am told that I don’t look it but sometimes I have to think awhile before I come up with a word or someones’ name. In my quiet times, I think a lot about my 50 years of marriage, the 2 girls we produced and what if I had married somebody else before I met before my husband. I wonder where those old friends are and where their lives have taken them. I enjoy each issue of InfoAve Daily very much. Thank you! I don’t understand why Alex Trebek sells for this rip off company. He’s massively wealthy and doesn’t need the pay. I’m sure he doesn’t care what everyone thinks, but to take advantage of the elderly is a low scummy thing to do. The man’s got a screw loose, I’m sure he could find another endorsement to hawk and try to be a more honest person.